Pair with the Chocolate Buttermilk Cake and Bittersweet Chocolate Icing, from the Altitude Adjustments article in the February 2017 issue. Place chocolate in top of double boiler over simmering water and stir until melted and smooth. Cool 4–5 minutes. Pour corn syrup into chocolate all at once, stir hard with wooden spoon about 2 minutes until mixture thickens, looks dull, and pulls away from pan. After firming, chocolate must be softened slightly, rolled out, and kneaded to develop plasticity. If too stiff, unwrap and microwave a few seconds. Roll out on a surface dusted with cocoa, cornstarch, or confectioners’ sugar. When chocolate is flexible, model it as you would clay. Form a cone for the base. Cut petal and leaf shapes from rolled-out dough, wrap around base of the cone, pinch at bottom, and flare out edges. 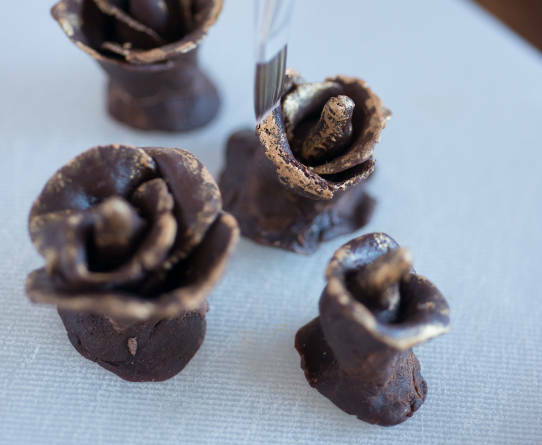 Blend gold powder with a drop of spirits to liquefy; brush on edges of molded chocolate rose petals.